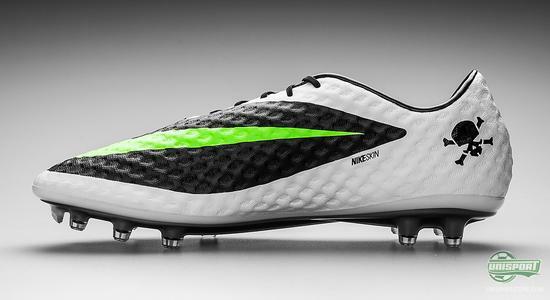 Nike seemingly can’t get enough colourways lately and next up is the lethal Hypervenom-collection. The latest Yellow/Black colourway has barely been around for a week and Nike are ready with a new colourscheme for the boot. This time round Nike bring out a black and white design, with just a splash of green. Come along, as we take a closer look at them now. 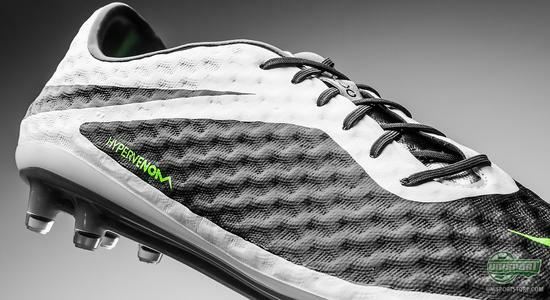 If you consider yourself a top striker and what to strike fear into your opponent’s eyes on the pitch, then the only right way to go is Nike’s lethal weapon – Hypervenom. With Neymar, Rooney and Lewandowski as the front figures, there can be no doubt about the Hypervenom’s popularity. 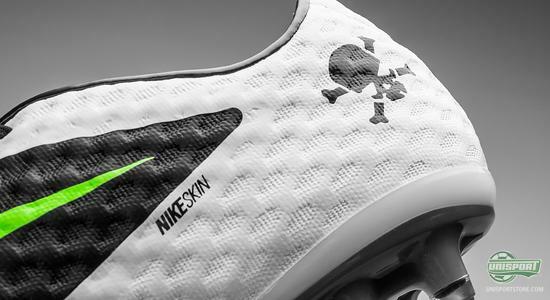 Made for the player with a need to quickly make sharp turns, Nike have developed the Hypervenom-collection with four main aspects in mind: Fit, Touch, Traction and of course design. Especially design looks to be an area they have put effort into, with this being the 8th colourway in the boots relatively short lifespan. 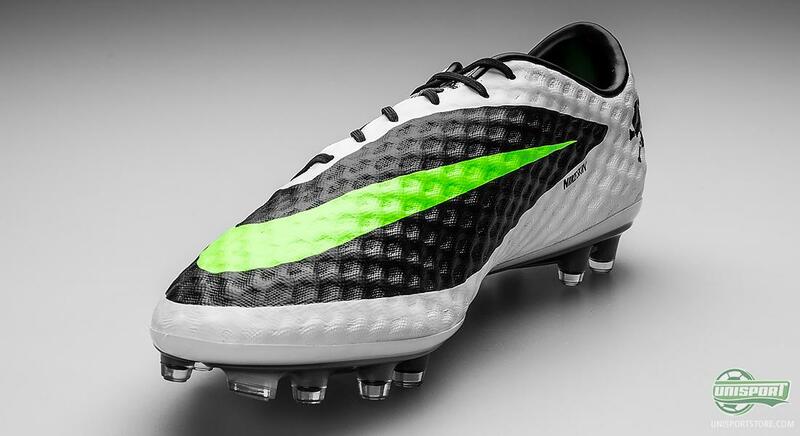 With the new colourway in Black/White/Volt Nike also present a boot for players, who don’t like too many colours on their boot, but still want to be part of the Hypervenom-wave. White is the new black, so when you combine that with black, you get a boot with a very classic aura. 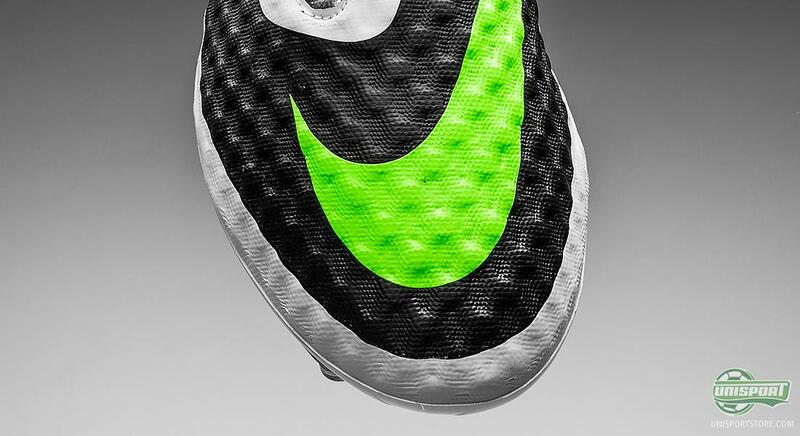 Completely black and white can however get a bit boring, so Nike have added a bit of neon green to spice things up. Just like with all the other Hypervenom boots, this one is also made with the flexible and light NikeSKIN material, which is especially thin and provides a very special ball feel. 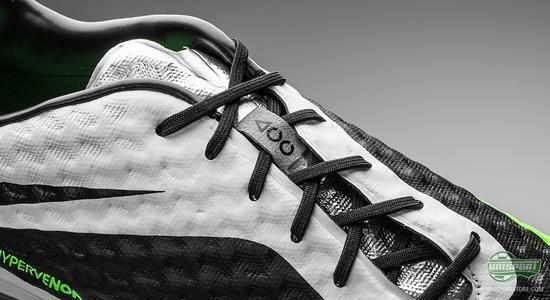 Based on the new and anatomical last, the GF13, the Hypervenom is made to adapt to as many different foot types, as at all possible. You are therefore ensured a unique feel with the ball, as you would otherwise have if you were playing barefoot. The small dents in the upper also work to increase your control, as they increase friction between boot and ball. Nike have naturally also used their ACC-technology, which works to give you the same time, no matter what the weather is like. 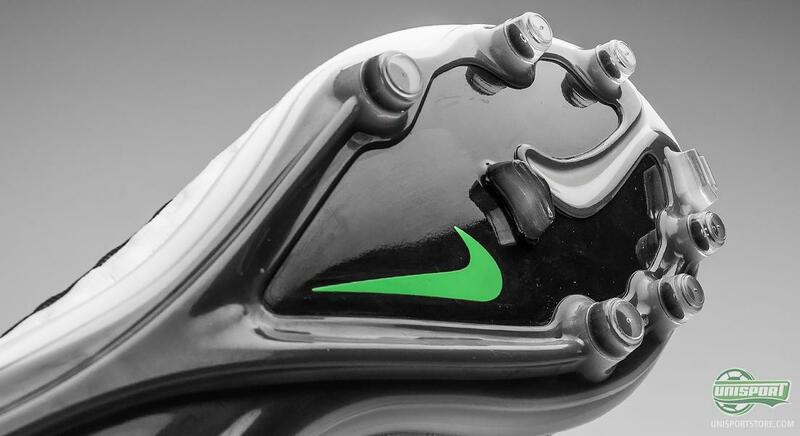 The Technology is worked into every Nike boots silo and is a special piece of innovation, which is incorporated into the upper, so it doesn’t deteriorate over time. Nike therefore solve a big problem, one the players in the rainy Premier League probably need more, than the Spanish in La Liga. The last element on Nike’s Hypervenom Phantom is traction and they have managed to optimise that part of the boot, with the soleplate. 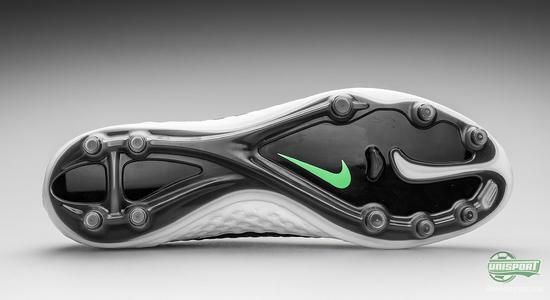 The new outsole has therefore been made with a split-toe design, where the power comes from the big toe. This is because Nike have spoken to many podiatrist, who have found out that power and acceleration, when quickly changing direction, comes through the big toe. 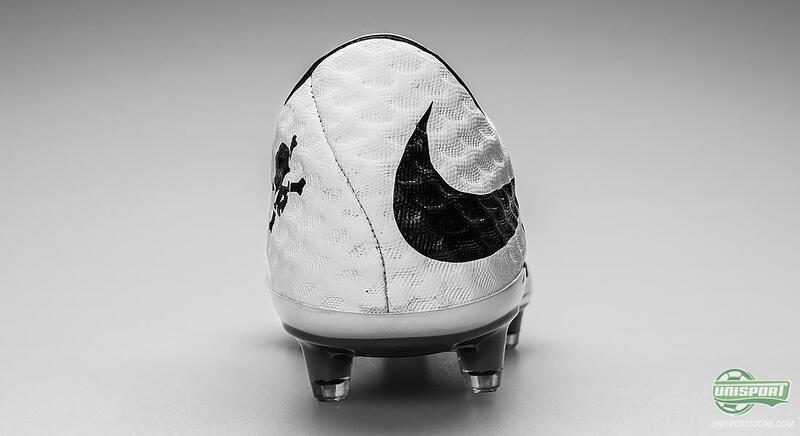 With the Hypervenom, Nike have also gone back to the classic stud-configuration with conical studs. They have done so, to give players the best movability, which comes because the studs penetrate and exit the ground quickly. The studs therefore accommodate a strikers need to be able to quickly twist and turn, to skin a defender. The popularity of Nike’s Hypervenom-collection is undisputable and we have to say Nike really exceed their promised goals with this boot. 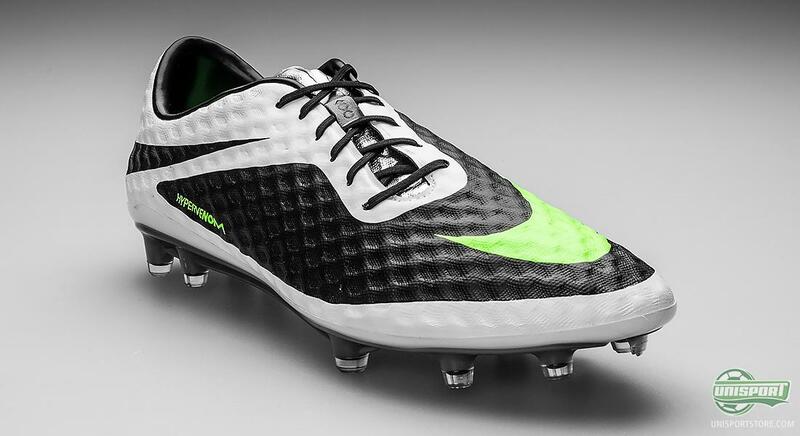 This colour combination of black/white/Green is the 8th of the new boot. What do you think about the boot and which of the 8 first colourways is your favourite? We invite you to share your thoughts with us in the box down below.